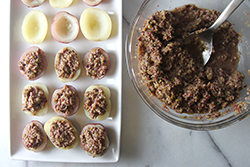 The salty tapenade pairs very nicely with new potatoes. 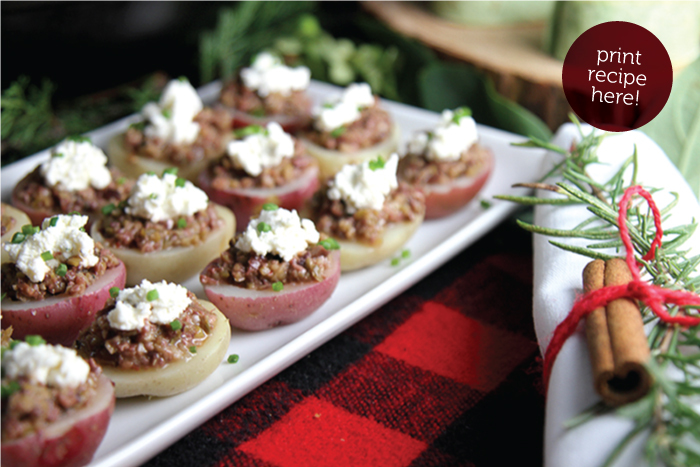 The perfect, bite-sized savory morsels are easy to eat finger food as an appetizer for any number of holiday occasions. 1. Drain the olives well, toss and turn until the brine has fully drained. 2. 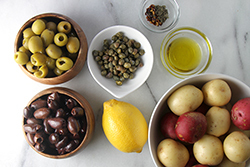 Place in the bowl of a food processor, the olives, capers, basil, red pepper flakes, black pepper, lemon juice, and olive oil. Pulse 2-3 times, scrape down the sides, and pulse again. Repeat until the mixture is finely chopped, but not pureed. Transfer from the food processor into a medium bowl. 3. Meanwhile, boil the small potatoes in a pot of salted water until just tender to the tip of a knife. 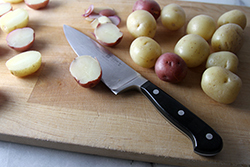 Halve each cooked potato; trim slightly to create a flat bottom if the half does not naturally sit in a level manner. Hollow out each potato half with the small end of a melon baller. 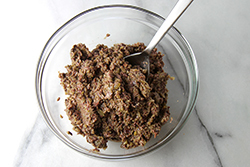 Fill each cavity with a generous spoonful of olive tapenade. 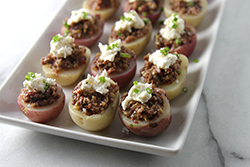 Top with a dollop of Boursin cheese. Garnish with a sprinkle of chopped chives.